Valbrandr Barrow is a burial ground located northeast of the Sun Stone and Skogsdrake Barrow. It is easily distinguished by the large stone arch above its doorway. 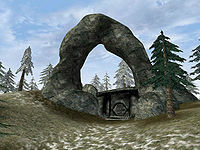 Valbrandr Barrow is the site of a quest and contains only one quest-related monster, the Valbrandr Draugr. Remember to let the Draugr attack you (without retaliating) while Ingmar tries to kill it. 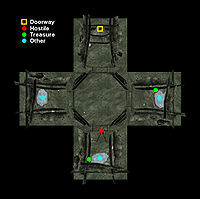 There is only one room containing three tombs with treasure on them. Ingmar in a Bind: A young warrior needs a decoy. Interested? There are three samples of raw stalhrim here. The treasure consists of a Amulet of Shield, some gold, a Nordic Silver Claymore, and a piece of Nordic armor. Outside the barrow, on the east side, you will find a pirate's treasure chest. This page was last modified on 10 February 2018, at 22:30.